The African Capacity Building Foundation (ACBF) launched its flagship publication, the 2017 Africa Capacity Report (ACR2017) which was on the theme: Building Capacity in Science, Technology and Innovation for Africa’s Transformation. The Report was launched in collaboration with the Economic Commission for Africa and the Department of Human Resources, Science and Technology of the African Union Commission, given the two institutions’ critical role in championing STI in Africa. The Report was also simultaneously launched in the ACBF regional office in Accra, Ghana, and in countries where case studies have been conducted for the production of ACR 2017. ACBF supported country launches in Cameroon (Yaoundé), Ethiopia (Addis Ababa), Morocco (Rabat), Nigeria (Abuja), Rwanda (Kigali), Tanzania (Arusha), Togo (Lomé) and Zimbabwe (Harare). The Africa Capacity Reports (ACRs)1 support the entrenchment of capacity development in Africa’s development agenda. Each Report, and its composite index, the Africa Capacity Index (ACI)), is meant to narrate all the critical capacity dimensions that are pertinent to Africa’s growth and economic transformation at country and continental level. Generally, the ACR offers the needed inputs into the decisions on what to finance in order to develop capacity; whether they be regulatory and institutional reforms that are key in the development agenda. The ACR 2017 recognizes that with the adoption of Agenda 2063, the commitment of Africa to the Sustainable Development Goals and the industrialization strategy, STI is critical. Furthermore, the 23rd Ordinary Session of African Union Heads of State and Government Summit adopted a 10-year Science, Technology and Innovation Strategy for Africa (STISA-2024) in June 2014. The strategy is part of the long-term people-centered Africa’s development blueprint, Agenda 2063. Agenda 2063 is underpinned by science, technology and innovation (STI) as engine of sustainable and economic transformation. STI is considered as a tool and enabler for achieving Africa’s development goals. Serve as a knowledge product targeting Africa’s continental bodies, RECs, policymakers, private sector, civil society, development partners, universities and research institutes/think tanks around the capacity dimension that require attention. This extends the frontiers of knowledge in this area. 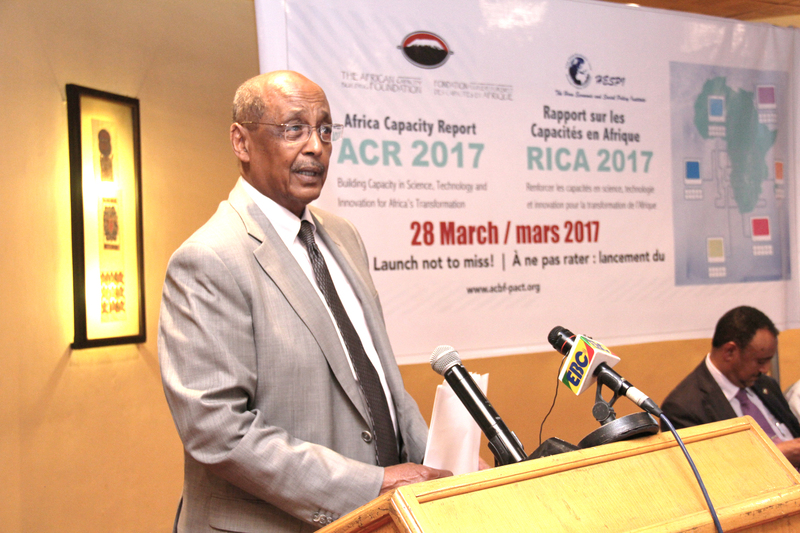 The Horn Economic and Social Policy Institute, an independent, non-profit think tank and consultancy firm based in Addis Ababa, Ethiopia, in support by the ACBF launched the ACR 2017 in Addis Ababa on March 28, 2017 at the Hilton Hotel.